When the priest put down his trumpet, he had to change his garment so as not to soil it. He then had to put on a different set of clothes and immediately clean away all the ashes on the altar and carry them outside of the camp (Lev. 6:8–12). Then, once outside the camp, he had to throw them onto the ash heap. Yep, it was really called the ash heap—that was a real place. In the midst of all of that fiery worship, God saw fit to have the priest take a break, change his clothes, and gather up the charred remains to get rid of every single ash. This was something the priest had to do himself. No one else could carry the ashes for him. He had to place his ashes on the ash heap himself. Doing this was almost like cleaning up a crime scene so there would be no evidence left that there was ever anything dead on that altar— it would look like it had always been a clean area to worship the Lord. When the priest came back into the camp, he was to change his clothes again, and on a clean altar was a fresh sacrifice. Think about the typology or symbolism of the ash heap. The ash heap was a visible reminder that all the sins and situations of the day were given to God. The priests weren’t allowed to take a break and eat a bowl of matzo ball soup or a brisket sandwich. There was no lying down on the job. Nope, the ashes had to be immediately removed from the altar of worship, because then and only then could they have the opportunity to start all over again with a brand-new time of worship. God knew that everyone needs a brand-new start. For the priests this particular type of offering was done often, which simply tells me that everyone has ashes all the time. Life happens. 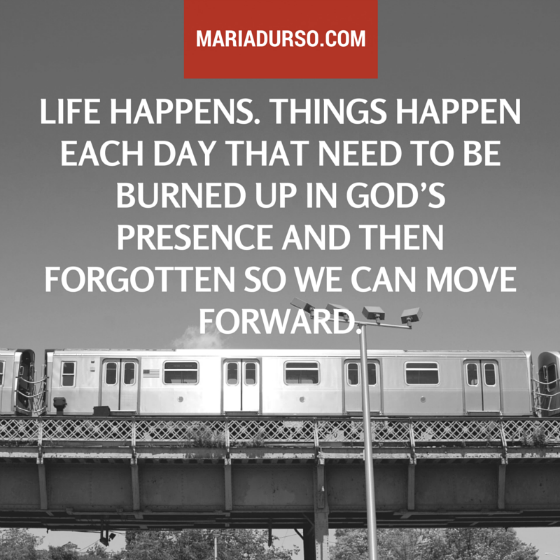 Things happen each day that need to be burned up in God’s presence and then forgotten so we can move forward. This step of removing the ashes was just as important as any step prior. The priest was told to carry his own ashes to place them on the ash heap. No one else could do it for him—not a servant or even a close friend could carry the ashes out. The priest had to do it himself. He had to tangibly throw those ashes onto the ash heap and walk back in freedom. I bet as they were walking toward the ash heap, carrying their ashes, the priests would take the opportunity to rejoice and thank the Lord for accepting everything they offered to Him that day. Isn’t that an incredible thought? Question: Do you need a brand new start today?